Today is the day the First Responders were supposed to be on The View, although I'm not sure that this was ever confirmed, please keep your fingers crossed. My local news station is reporting that Rosie may be announcing her departure soon. MANCHESTER, N.H. - - Rudy Giuliani said if a Democrat is elected president in 2008, America will be at risk for another terrorist attack on the scale of Sept. 11, 2001. But if a Republican is elected, he said, especially if it is him, terrorist attacks can be anticipated and stopped. “If any Republican is elected president - - and I think obviously I would be the best at this - - we will remain on offense and will anticipate what (the terrorists) will do and try to stop them before they do it,” Giuliani said. The former New York City mayor, currently leading in all national polls for the Republican nomination for president, said Tuesday night that America would ultimately defeat terrorism no matter which party gains the White House. 9/11 Revisited is the # 3 most watched video on google! 9/11 Revisited is currently the # 3 most watched video on google video! Please help keep it in the top 10 by posting a link or putting the video on your myspace page and/or website. INN World Report interviewed Dr. Crockett Grabbe - professor of physics at the University of Iowa - regarding his thoughts on the 'collapses' of WTC1, WTC2, & WTC7. 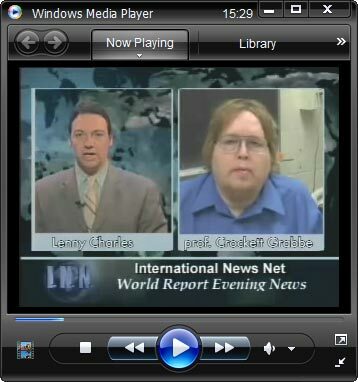 In this interview he lists numerous reasons to suspect controlled demolition and expresses support for alternative theories. Thanks to whatreallyhappened.com for the heads up! A screening of Loose Change 2, and Jim Marrs will be speaking after the film, April 25th, 2007. This is a free event held at Space Gallery in Dallas 2814 Main St. Here's a link to the event flyer. Cool Hand Luke from WeAreChange.org confronts Zbigniew Brzezinski. Please donate to www.WeAreChange.org so we can get another camera so we can do more of these actions more efficiently and not risk getting the footage taken away. I have spent quite a few hours going through and downloading every single interview PDF file available online and building a ZIP archive with them all conveniently stored together. These are the original unedited World Trade Center Task Force Interview Transcripts taken between October 2001 and January 2002. I have taken them from the NY Times website, so hopefully there are no questions over credibility. Please host these if you can (filesize is 44MB), share or whatever as they were tricky to put all together and are not located in many places (two websites I found, none in easily accessible archive format, all separate). Please help store for posterity and future analysis.